Discussion in 'TCG News & Gossip Discussion' started by EeveeLover, Mar 4, 2008. No matter your view of the current situation in Iraq, this is a good story to hear for the kids. Pokemon is mentioned several times, and has a dancing Pikachu character. Wow, just simply wow. I'm speechless. Regardless of your view of the US involvement in the war you have to feel amazingly human seeing this. If anyone has an address to send cards to, please pm me. Yup, mine are in English, but I think the children would like the pictures anyway. Thanks for the feedback, I had the same thought, but I have no idea how to get any contact info. Actually, I am going to contact CNN and see if they can forward me to anyone that might give me some info. This might be a good one for PUI to get into as well. They might have cards of a more appropriate language. EDIT: I contacted the reporter who did the piece, to ask for more info. That segment is sooo true...Made my day! Without hope, there is only sadness and failure. And those kids, certainly don't show any of that! Id also be willing to send some cards! Just keep us up to date. Even feel free to PM me with the details! I remember seeing this show or was it another one when I went back to Iraq two years ago. All my cousin and nephews loved it so much. Amazingly, there were alot of pokemon items in Iraq. From shirts to toys but all they get wrong are the colors. Red pikachu and blue charizard do look cool though. Thanks for sharing. Please update us if you hear from CNN. I'd send cards or plushies or toys too. The cards might cause problems. They are banned in many arab countries because the mullahs mistakenly believe the colorless energy symbol is a star of David and therefore is Zionist. Dont send anything with a colorless symbol then. That was just modified. I could do more research on unlimited. But I want to make sure that they are not banned. Trainers for the more part also don't have the colorless symbol. And by "many arab [sic] countries" you'd be talking solely about Saudi Arabia, a country widely renown for its acknowledgment of human rights and advancement of culture. Mexican churches called the game "demonic" as well, should we stop Pablo from going to Worlds because it would offend some religious extremists? This is before getting into the whole debate about Sunni vs Shia and the Christians, Jews, atheists that live in the country. "Arabs say jews did it, lulz" is not a valid excuse to stop making some kids' days. Just like our soldiers setting up a soccer league there to help reach out to the kids, I would like to see PUI cooperate and possibly even bring the game to Iraq. Besides, if PUI starts printing cards in Arabic (not sure if they already do or not) there's a huge untapped market there, so many Arabic speaking countries that they could extend the game to. 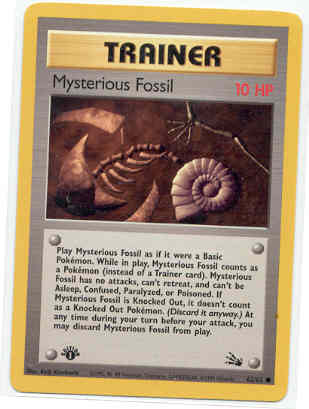 Note the old mysterious fossil can be played and does not have the :colorless. The fatwa by Saudi Arabia's Higher Committee for Scientific Research and Islamic Law said Pokemon "possessed the minds" of Saudi children, promoted Zionism and involved gambling which is banned in Islam. The edict stated that the video game and cards featuring the Pokemon characters have symbols including "the Star of David, which everyone knows is connected to international Zionism and is Israel's national emblem." A fatwa issued by a committee in Saudi Arabia. SEVEN YEARS AGO. Would you obtain from sending Pokemon cards to kids growing during wartime to needy Christian kids due to a declaration by some Mexican churches 7 years ago? Similar logic here. If you're going to send some cards, send whatever you can spare and also donate to our troops who are working on similar projects as well. And there are many more as well, a quick Google search will come up with many others. Regardless, without going way off topic, my point is that send whatever cards you have if you are serious about making a donation here, the game was only banned in Saudi Arabia, and that was seven years ago -- Iraqi kids and families are not affected by declarations of Saudi Arabian committees. I do know that they are not sold in these countries because of other posters on other boards. I was just suggesting to be careful. toy Pokemon figures might work better.